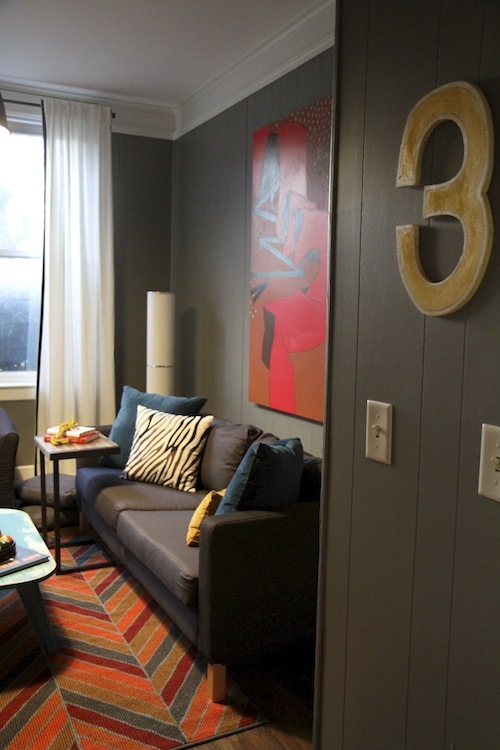 The Room Service Atlanta/UMCH reveal, Part 1! Last week was a complete whirlwind of hard work and amazing inspiration at the UMCH! I will admit that a couple of times throughout this project, I have said to myself, “What I am thinking?” “There’s no time!”, but the end result of this amazing project makes all that self doubt so incredibly worth it. The cherry on top is the collaboration with so many other wonderful designers, sponsors, workers, volunteers and the staff at UMCH. Let’s take a look at where we started. 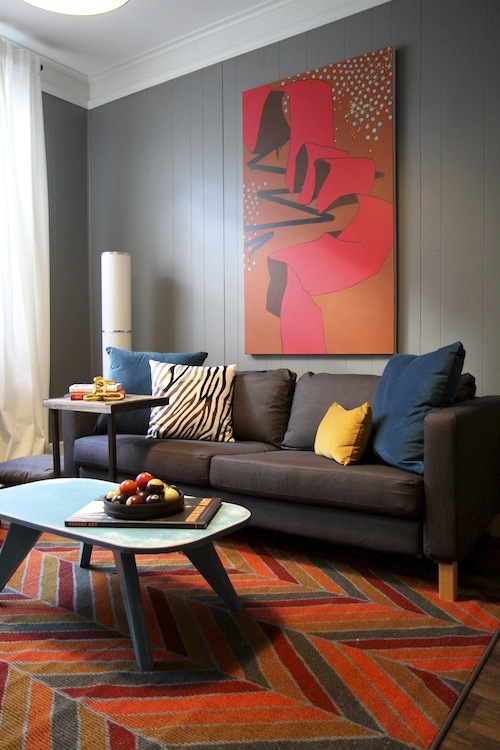 Rhoda, Angela and I worked on the lounge and bedroom for one young man as well as the entry of the cottage. Let’s start with the lounge. 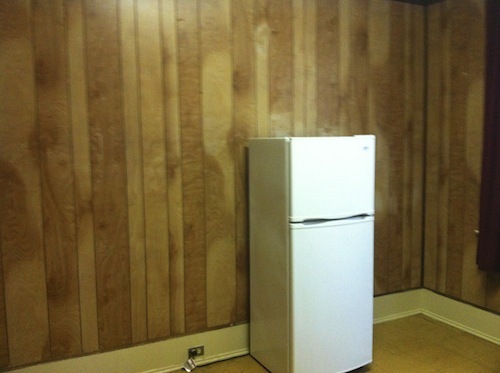 Here’s the before. And the after. See those beautiful floors? Vinyl. Yes, vinyl. Can you believe it? A huge thank you to Lowes for that fabulous donation! You’ve gotta love a blogger with great connections! Thanks Rhoda! The artwork that Angela created for our spaces just blew me away. This is just one of 7 pieces she painted! A closeup of two other pieces by Angela. 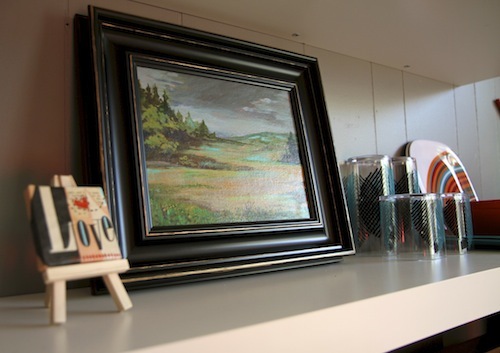 How much do you love that tiny piece with it’s tiny easel? 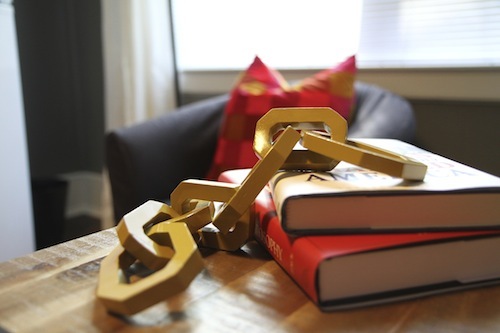 A closeup of the chain that I found at Target in the Nate Berkus collection. I managed to do a little thrifting to find a few vintage pieces. 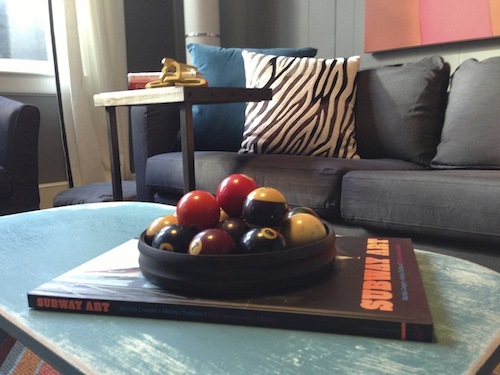 These pool balls were one of my favorite finds! The books came from the discount section of Barnes and Noble. I mentioned Lowes’ donation earlier, another huge thanks goes out to Purdy, Dutch Boy, Sherwin Williams and Zinsser for the paint supplies, Kim, Mari, Elena and Heather for your time and talents and Chris for everything, including all those things we added on at the last minute! And to those of you who made financial donations, thank you, thank you! We could not do this without all of you helping in your own special ways. To my partners in crime, Rhoda and Angela, asking 3 creative types to work on one project is no small feat. You’re hard work, commitment and attention to even the smallest detail was so inspiring and I’m so honored to have worked with you both. 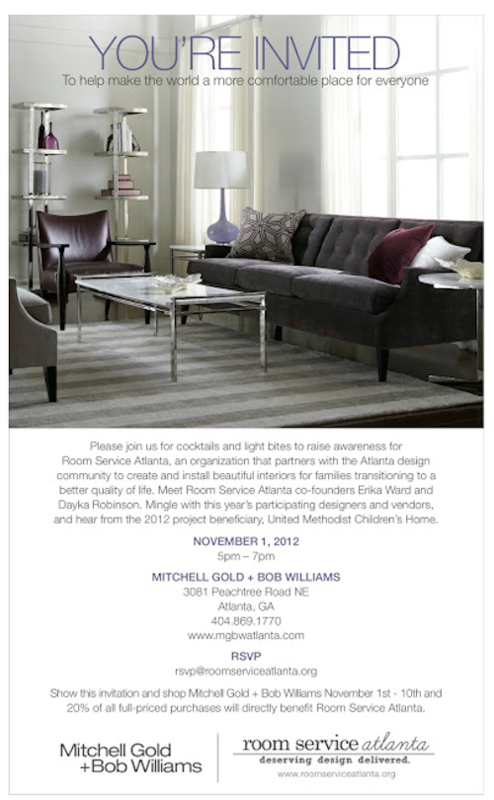 If you’re in town, be sure to join us for the Mitchell Gold + Bob Williams party November 1st from 5pm to 7pm. See my post here for details and rsvp info! There will also be an Open House at UMCH on Monday, November 5th from 3pm-5pm. Stay tuned for part 2, the bedroom and entry on Friday! 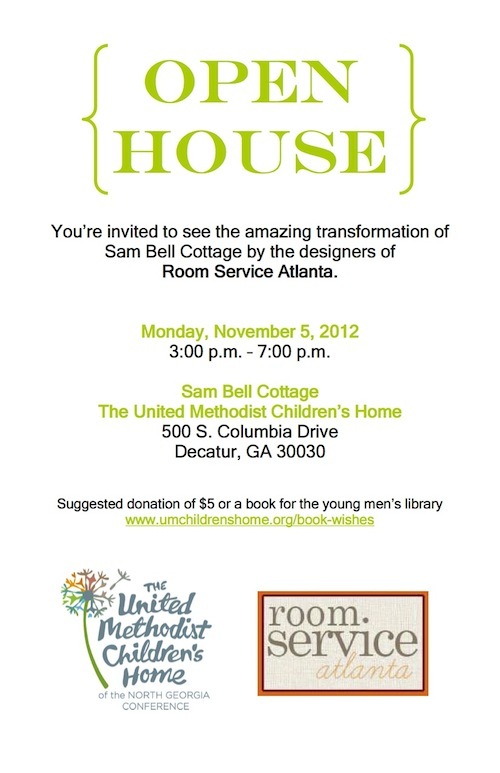 Join Room Service Atlanta, the participating designers, our sponsors and RSA’s premier sponsor Mitchell Gold Bob Williams on Thursday, November 1st to celebrate the install of our latest project at the United Methodist Children’s Home. 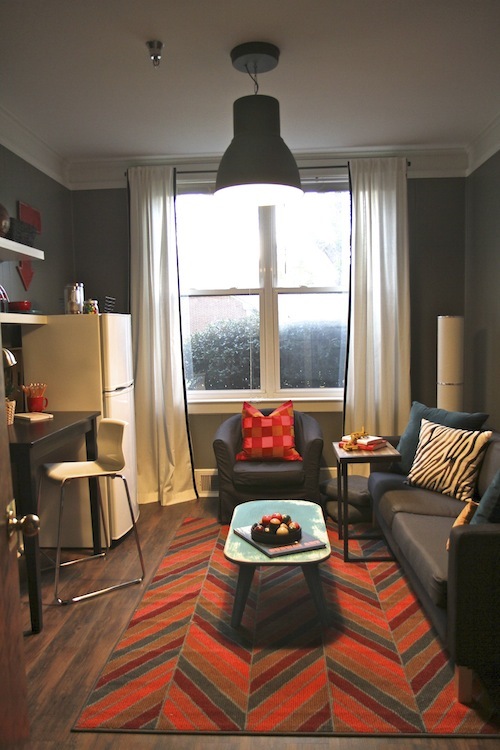 From what I hear, there will even be a sneak peek of our finished spaces.